for every traveler to make their journey Amazing & Memorable. We offer expert and creative guidance whilst taking care of every small requirement of the guest to give a distinctive experience of India. We specialize in providing customized services to individual traveler, group tours, special interest tours, luxury trains, charter and cruise ship ground operations, while investing in eco responsible and socially aware tourism. Whether you know what type of trip you want, need to mix and match destinations in an itinerary, or want a specific theme based India travel, we make it easy for you to strike the best travel plan. 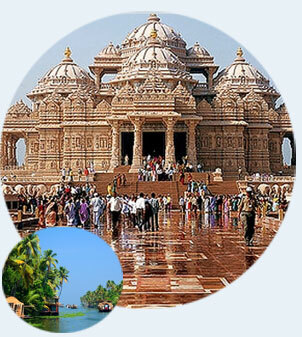 As we have served scores of travelers coming to India from all over the world, our valuable suggestions by our experienced travel experts grace your India journey. Go Gateway India has something for every kind of traveler - be it families, youth, students, honeymooners - groups or individual for a holiday in India. Go Gateway India has a range of holiday options that cover every conceivable tour requirement. Whether it is an extended vacation with the family, a paragliding spree with friends or simply a rejuvenating weekend break, Go Gateway India offers you an opportunity to visit and explore all the splendors of India. Go Gateway India also offers a wide range of customised holidays thereby giving individual travellers the complete freedom and flexibility to define their preference for the destination, length of stay and pace of travel. We understand that security and comfort are basic to any successful travel journey. A great deal of trust on our part is invested to make your travel experience perfect and comfortable.